What if Nintendo made a new console dedicated to retro-style games? 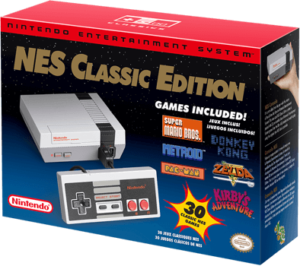 A couple of weeks ago, prior to the Nintendo Switch announcement, I had a weird dream in which it turned out that the upcoming NES Classic Edition actually was the NX. This week’s show focuses on indie developers and an excellent editorial on various bills aimed at video game violence. This week hosts Andrew Eisen and E. Zachary Knight talk about an indie game that got a Canadian gentleman fired from his day job, another indie developer calling Kickstarter stretch goals “bullsh*t,” and a discussion on this Popcults.com editorial. All this and the latest GamePolitics poll results await in Episode 39. Download it now:SuperPAC Episode 39 (1 hour, 7 minutes) 61.9 MB. As always, you can subscribe to the show on iTunes and use our RSS Feed to add the show to your favorite news reader. You can also find us onFacebook (where there’s an app that will let you listen to the show), and on Twitter @SuperPACPodcast. You can send us feedback on the show by dropping a note to superpacpodcast@gmail.com.